From the desk of Stu Harman, our support and coaching expert. In this article Stu explains how to create your own presentations using animations and images to produce personalized consultation presentations or templates. BiteFX provides twelve animation groups in the Animation panel that are named according to occlusal topics; they are Open-Close, Guidance and Contacts, Effects of Bruxing, Interference and TMJ Effects, Effects on Molars, Diagnostics, Treatments, Neutral Zone, Sleep Apnea, Condyar Issues, 3D Views of TMJ, and Muscluar Issues. Each of the animation groups include a select number of animations related to that topic, comprising more than 110 animations in total at present. 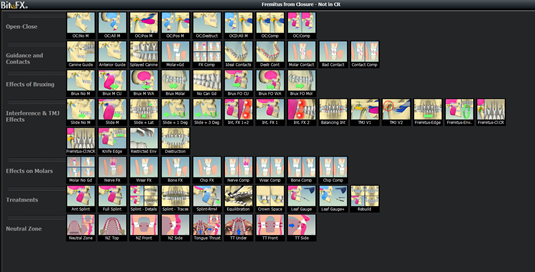 BiteFX also includes over 100 occlusion related clinical photographs and images in the Picture panel that can be used to show actual clinical examples of malocclusion and treatments.